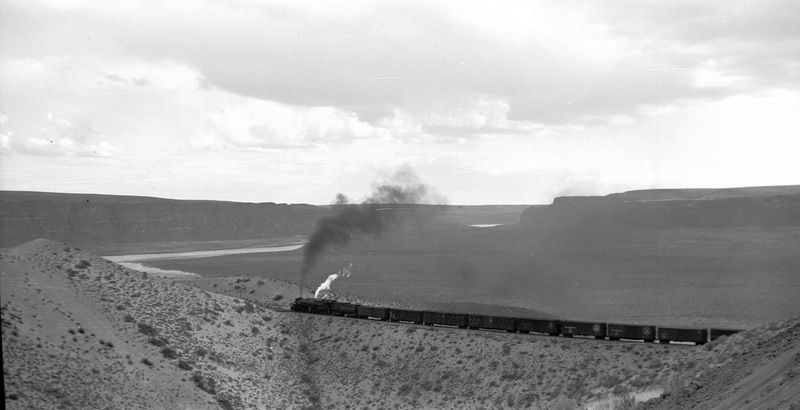 This approximate 1943 view shows an R-2 class steam engine leading an eastbound train next to the Trinidad sand spur. 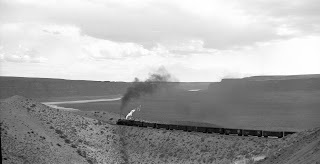 The fill the train is on was built as part of the 1909 realignment through the area. Just in the left hand side of the photo you can see part of the cut through the sand where the grade used to pass through the sand onto a large curved wooden trestle, of which you can still see the stair step pattern in the hillside. Note that the river is still free flowing at this time, as Wanapum Dam is still about 20 years away. Now that is a cool picture!